This article first appeared on our web site after the 2000 competition in response to some common problems that were heard on many of the tapes of that year as well as previous years. It was subsequently requested for the summer 2000 issue of the ITA Journal. For those of you who entered this year's Competition, we appreciate your efforts. I know how hard it is to make a tape for an audition, as I have made a few myself. Tape making has become an integral part of orchestral auditions. Let's face it, when over 200 people apply for one job, there's got to be some way to weed out some of those folks. Tapes are not a perfect answer, but they are one of the most popular answers out there right now. Because of the tape's importance in the whole auditioning process, I have decided to comment on some of the things I and the rest of the Minnesota Orchestra Trombone Section heard on many of the Zellmer-Minnesota Orchestra Trombone Competition tapes we received this year. Let me start off by saying that many of you did an admirable job. There were quite a few tapes that contained some very fine playing. However, the majority of you sent faulty tapes. I'm not talking about the occasional chipped note or rushed rhythm. I'm talking about much more basic problems such as tapes with such poor audio quality, it's actually a struggle to hear the playing. Or worse yet, failing to simply follow instructions. Ladies and gentlemen in pursuit of orchestral jobs; when an audition committee is faced with the daunting task of listening to a hundred or more tapes, the unfortunate truth of the matter is that they are generally looking for reasons to dismiss applicants. The last thing a group of people wants to do while listening to applicant number 63 is struggle to hear the music over all of the background hiss. I know that decent recording equipment can be expensive. However, look at it as an investment in your future. You play the best instrument you can, right? Well, we certainly can't tell that if all we hear is constant fuzz and crackling or distortion because you failed to use a decent tape recorder and mike. While you're at it, why not chip in an extra couple of bucks and buy a decent tape as well. I'm not talking about going out and spending thousands on the state of the art equipment. Just something that will produce a relatively clean sound. Like it or not, every sound on that tape represents you. If you seemingly don't care enough to send the very best representation of yourself, what do you expect the committee to think of you? If you were going in for a job interview for a large company, would you send in a resume that you wrote down on a dirty napkin? My number one pet peeve in listening to tapes, however, is an applicant's failure to simply follow instructions. Committees put instructions on how the tape should be recorded for good reasons. The committee is trying to preserve anonymity and a fair playing field by having all of the tapes sound the same. In our brochure and on this website, it states clearly that all the excerpts were to be recorded "in the order listed." There were quite a few applicants who recorded the excerpts in whatever order they felt like playing them. Also, there were only two-that's right-two bass trombonists who started the Wagner Lohengrin excerpt in the correct place. This is an inexcusable mistake that affects your tape negatively in two ways. The first is obvious; "This person has trouble following directions." That's a huge part of the job as an orchestral musician. Strike one! Strike two is that the committee is immediately distracted away from your playing and is now trying to figure out what you're going to do next. Pretty soon your tape is over, and no one remembers anything about your tape except that it was recorded in the wrong order or that you started excerpts in the wrong places. I know this sounds nitpicky, and it is. However, like I said above, audition committees are unfortunately looking for reasons to cut tapes. Don't help them out by doing something as foolish as putting the excerpts in the wrong order or playing the prepared solo with an accompanist when the instructions clearly state that it should be played unaccompanied. Two things that will almost assuredly get your tape dismissed immediately are talking and recording the wrong repertoire. I know to most of you this seems like common sense, but it's happened. The tenor trombone solo for last year's Competition tape was Gaubert's Morceau Symphonique. There were more than a few recordings of Guilmant's Morcea Symphonique. Every one of those tapes was immediately stopped and the applicant was disqualified. Once again, the committee cannot judge you fairly against the rest of the competition if you have not played the same repertoire as everyone else. Think of how much hard work went into making those tapes... for nothing. Also, if you decided to talk out loud while you were recording, I'm afraid you received the same treatment of instant disqualification. This is the only way to insure total anonymity. The unfortunate truth about entering this competition or, worse yet, auditioning for an orchestral job is that often times a hundred or more people apply for the prize or that one spot in the orchestra. Audition committees generally don't have the time or the patience to try to figure out why you might have committed one of the aforementioned offenses, and you can rest assured that you probably won't be invited to that particular audition. Remember, at this point in the audition, your tape is your only representative in the audition committee's eyes and ears. It's very easy for them to hit the STOP button. Don't help them to do this by dropping the ball on something that's not even related to your playing. If you happened to follow all the directions and send a tape of at least decent recording quality, we were actually able to listen to your playing. Let me tell you what a committee is generally looking for in a tape. When a committee is looking for good reasons to dismiss tapes, faulty rhythm and pitch are two of the biggest. Would you want to sit next to someone who plays out of tune and has a poor sense of rhythm? However, there were very few, if any, tapes we heard where these two fundamental aspects of playing weren't an issue. On one tape, The Ride of the Valkyries sounded as if it were written in 7/8 meter. The dotted quarter notes simply were rushed to the point of losing an entire eighth note. Subdivision is key. If you have eighth notes running through your head as you play this excerpt, you're going to be a lot less likely to rush or drag as badly. Believe it or not, one of the worst excerpts for rhythm is Bolero. Everyone is so concerned about the high notes that they fail to subdivide through the tied notes. Invariably, the sixteenth notes come later and later and the whole thing slows down. Or, the sixteenth notes have one tempo and everything else has another. Either way, the end result is the same-NEXT. Other concerns that show up on tapes are missed notes, rough articulation, and sound. One of your tapes contained a Ride of the Valkyries in which the applicant missed the first two notes and then proceeded to splatter his or her way through the rest of it. Unlike a live audition, you do have opportunity to retry an excerpt. Your tape should be as close to flawless as you can get it. It's true that you do want to send in a tape that is indicative of your playing. However, if it takes you 60 takes to get the solo from Bolero with no blips in it, you may not be quite ready for that particular audition. For this competition, we were more lenient when these problems occurred than your average committee. I was not looking for note perfect performances. We realize that most of our applicants are students who are currently working on many of these problems. However, when someone is missing notes left and right and has unclear articulation on most notes over a mf dynamic, that person is not going to advance. Sound is a factor that is more important in the live audition, but receives attention in the tape round as well. This is made more difficult, however, when the tape quality is lacking. One thing that will help is obviously to use good equipment, but also to try to record all excerpts in the same acoustic. I know this is not always possible. However, make every effort to send in a tape with a consistent sound. This tends to be less distracting to the committee and they can then start to get a feel for your actual sound. 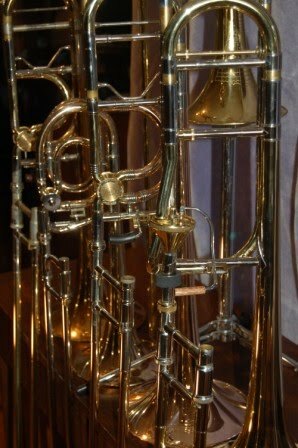 Let's face it, in this day and age there are a lot of trombonists out there. Many of them practice the fundamentals of rhythm, pitch, sound, articulation, etc. constantly. They strive to make every articulation the same, the sound always even, and pitch as near flawless as possible. This type of player is your competition. This kind of attention to detail gets their tape accepted into a live audition. It doesn't always win the competition or job, but it is a big first step. Our Competition has a unique quality to the tape round that many other tape rounds do not in that we have our applicants perform sections from the solo repertoire. If you have this opportunity to play a solo, take it! Show that you can actually play musically. This is your biggest opportunity to show that you are indeed not only a trombone player, but also a musician. We had so many applicants play both the Jongen and Bach so squarely. There was tremendous lack of phrasing and no real feeling for how the piece really goes. I'm not talking about going out and copying someone's recording or someone else's playing of the piece. I'm talking about your own interpretation of the piece. Try to say something with the music in addition to playing it in tune, in time, and with a good sound. I am looking for the player that plays the solo literature soloistically and the orchestral literature orchestrally. Again, I know this sounds like common sense, but more often than not, your tapes said otherwise. In my opinion, the player that plays in tune, in time, with a great sound and actually says something musical with his or her playing is the one that's going to get my vote. It is possible to be both a great technician and a great musician. One without the other is just half of the picture. Once again, I would like to thank all of you who submitted a tape this year and urge all of you still eligible next year to try again. Over the last three years since the Zellmer-Minnesota Orchestra Trombone Competition began, we have heard many talented tenor and bass trombonists with much potential. Many of our winners and finalists have gone on to win professional jobs in the orchestral field. We hope to hear from even more of you next year. As always, you can email us here at info@zellmer-competition.com with any questions or concerns you may have about this competition or playing in general. Keep practicing!